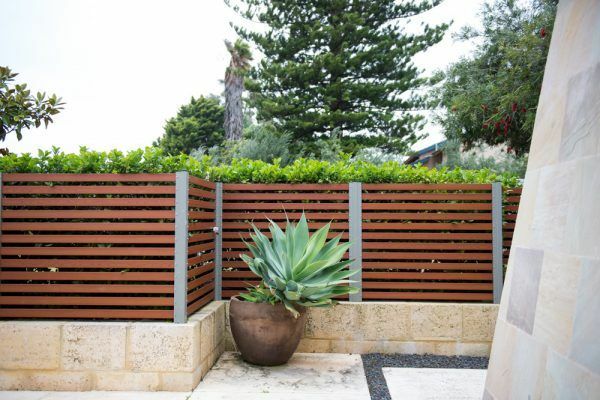 WA owned and operated, Fencemakers design, manufacture and install slat fencing for Perth homes and businesses. 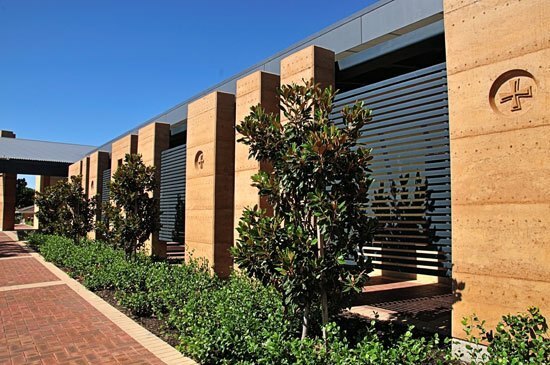 The aluminium range of fence slats by Fencemakers is another great innovation that adapts flawlessly to either horizontal or vertical installation. Installing fence slats is the perfect solution for maintaining your privacy while still allowing sunlight and airflow through the fence. 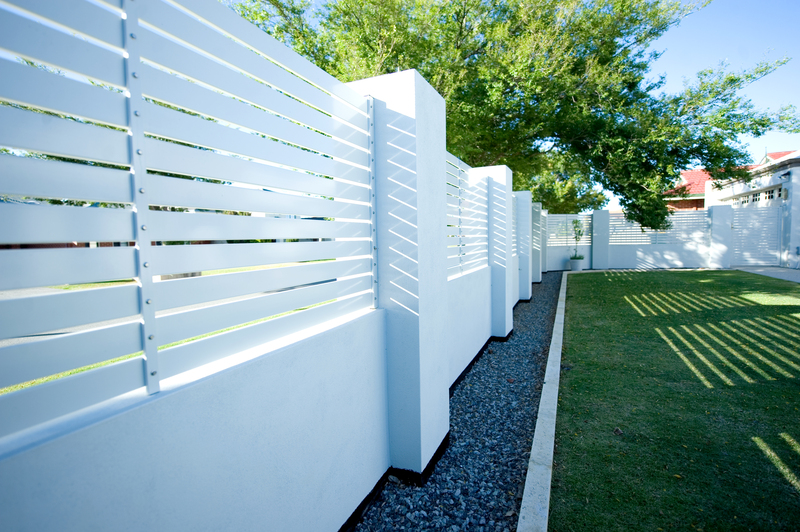 At Fencemakers, we can also supply Decorative Fence Panels for when only a complete privacy option will do. All of our slat fencing & gates have fully-welded frames, which get sanded, buffed and powder-coated to ensure that they are strong, smooth and eye-catching. It’s very important that the frames are welded to ensure the gates and fences don’t warp or sag. Many competitors use screwed-together frames, a cheaper option which will sag and lose shape over time. Our slat fencing and gates use our revolutionary and patented channel system, which ensures a seamless finish to slat fencing and gates. We will custom-make all channels to the specifications of every job. Our slat system allows customers to choose the size of the gap between slats – an important factor when deciding upon the level of privacy you want, in addition to complying with the regulations set by local councils and shires. With our channel system, each slat has its own slot cut out into the channel. The benefit of our channel and slot system is that it creates a seamless finish, as there is no open gap in the channel between the slats for spiders and dirt to collect. It also has the added benefit of allowing single slats to be easily replaced if damaged, rather than having to take apart the whole fence or gate as is necessary with competitors’ products. Slat fences from Fencemakers can be custom-made in a range of slat sizes and spacing options, giving you total control over the view out of and in-through your fence. Slats can be thin with wide spaces for the front garden to allow a view out onto the path, while back garden slats can be wider or even full panel to allow more privacy. 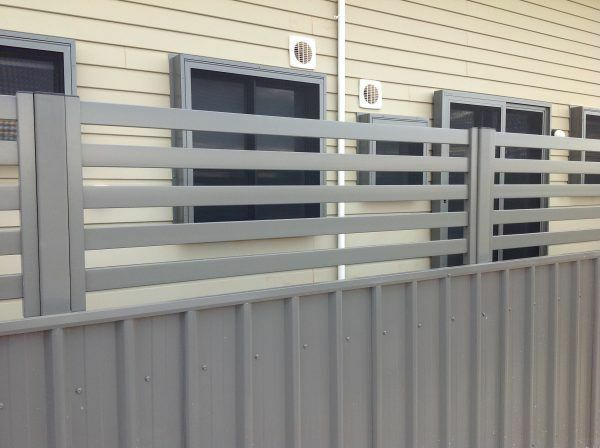 The aluminium slats are manufactured in Perth, just like the rest of our fencing products. 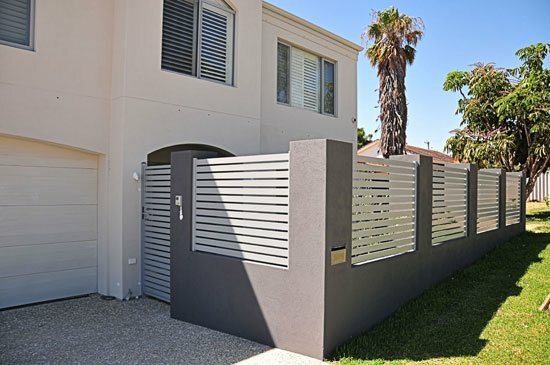 The slats can be installed either horizontally to suit the modern architectural look, or vertically to reflect the appearance of a picket fence. All of our slat fencing is powder-coated for durability and available in a wide range of colours and styles to compliment the exterior of your home or business. 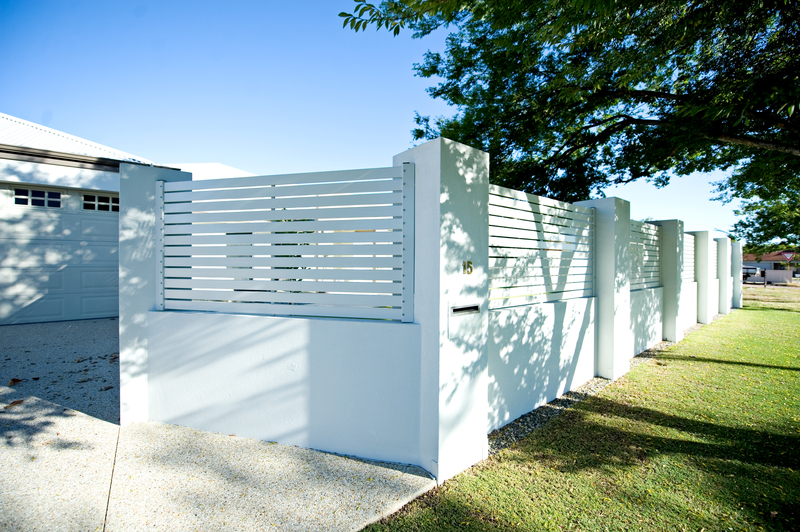 We can pair your slat fence with custom gates to fully secure the perimeter of your home and create a stylish finish. Installing slat fencing can add substantial value to your home or business. 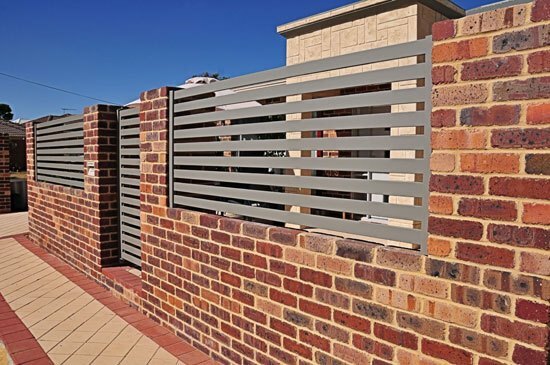 Each local council has strict guidelines regarding the gaps between slats on fencing at the front of a property. Fencemakers will adhere to these guidelines and can help you navigate through your legislative responsibilities for installing slat fencing at the front of your property. Panel fencing affords maximum privacy to your home or business. 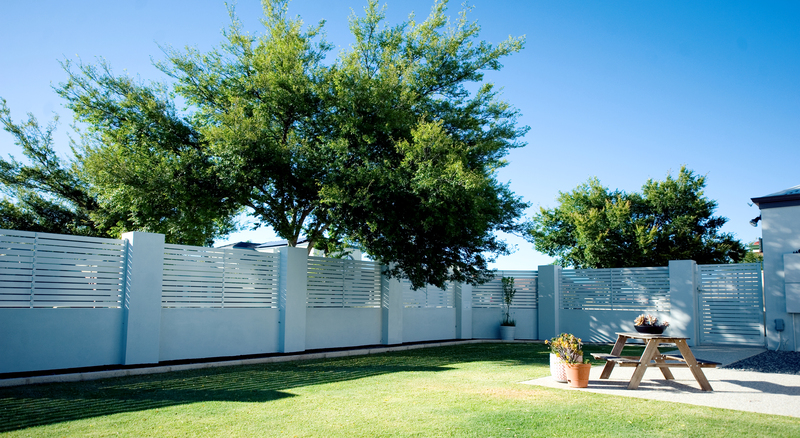 The soft and stylish shades of our powder-coating provide an elegant and modern look for your decorative fence panels. Panel fencing is more suited to the rear of the home, while matching slat fencing and gates can be paired for the front of the property. Installing fencing panels can add substantial value to your home or business. So, if you’re looking for slat fence supplies in Perth, look no further! Check out our gallery below for some inspiration for your next project. 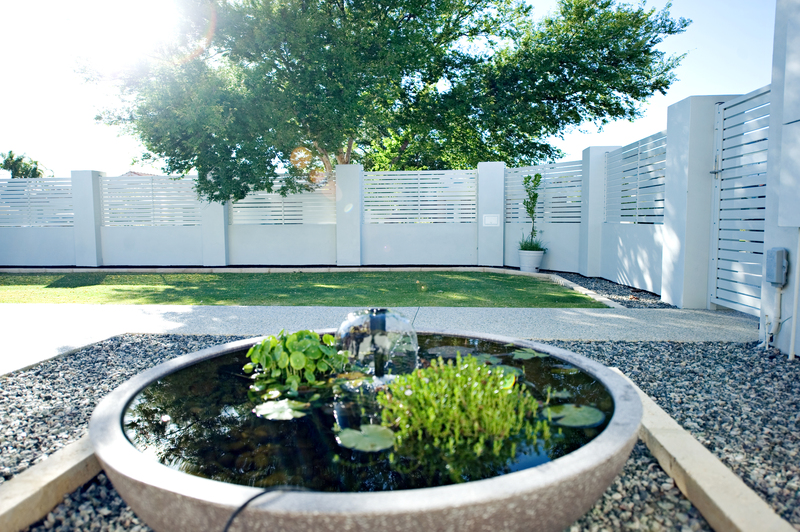 To talk to the panel and aluminium slat fencing experts in Perth, get in touch below to submit an enquiry. 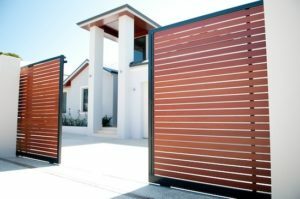 Colorbond vs Premium Fencing – Which to Choose?